I didn’t read the synopsis on this when I grabbed it. All I knew it was a Dark Fantasy and honestly the cover made the dude look like the devil so I thought well this will be interesting going in blind. So, Mia is trying to find her brother who ended up going missing for a dig site along with his coworkers. She ends up indebting her self to the mysterious Mr. King. You know theres something weird going on with the dude which makes him sort of interesting because I spent my time wondering what fantasy type he could be. He was pretty much a grade A alpha a hole. And Mia well she was pretty fierce with him even though she kept finding herself attracted to him ( even though she didn’t want to be) . King pretty much acts like he owns Mia and is constantly getting mad at her for not listening to him ( which since he has to keep saving her I suppose he has the right to be mad at her, probably make me mad too) . Anyway, some light action scenes, mystery, romance , lust and some naughty talk. I think my issue with it it just kind of dragged at a few too many points and I couldn’t get into it. It was okay and I’m hoping its just the first book having to set everything up and keep a good storyline. Theres a twist at the end and a cliffhanger that I kind of makes me want to pick up the next book but I’m in no rush to even though I’m still trying to figure out what exactly is going on with these characters and their abilities plus I want to know Mack’s story. For me it was an okay book. I’m sure others are going to like it or even love it. It had a decent story, if you like the whole a hole alpha male who saves the chick but acts like he hates her thing and then find out that he has a painful past that makes him that way King is definitely that character ( even though I still don’t know what happened in his past except what I could kind of piece together). This book is worth a try. 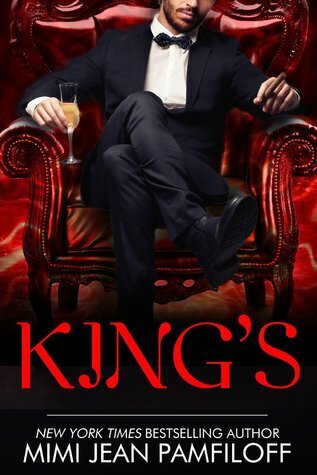 Its an easy read and not long so if you don’t like it its not a complete waste of time and if you do well its part of a trilogy so there is more of King, Mia and the other characters. Even though I didn't care for this book I still plan on trying her other series as well. I heard great things about this author.